Gonzo’s Quest is a video slots game that has been designed and developed by Net Entertainment, often simply referred to as NetEnt. The game is based on the Spanish historical character Gonzalo Pizzaro, a historical conqueror. Gonzo’s Quest follows Gonzalo’s quest to find Eldorado, the lost city of gold. The Gonzo’s Quest video slot game makes use of the Avalanche Feature. Here, symbols will fall on to the reels from above. If symbols land to form a winning pay line, the winning symbols will explode with some 3D animation. More symbols will fall from the top to fill the holes that have now been left. Symbols will continue to fall as long as winning pay lines are formed. Each additional win will be multiplied. Once the wins have been awarded and no more winning pay lines are formed, all the symbols will fall away and will be replaced by new ones. The theme of Net Entertainment’s Gonzo’s Quest, as mentioned, is based on Gonzalo’s search for Eldorado. Gonzo, the animated character, appears in uniform, entertaining players by scratching his beard whenever he is bored and spinning his helmet, dancing and celebrating whenever a win is made, and moonwalking across the screen when particularly high payouts are rewarded. 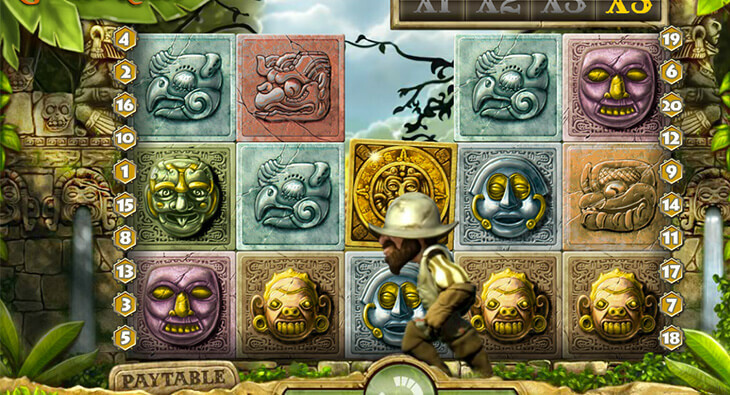 The game is set amidst an ancient world, with an Inca temple in the background with lots of forest greenery, and water pouring from a stone-carved face. The sounds of the game are reminiscent of the jungle, and falling symbols are made to sound like falling rocks. The symbols themselves are detailed, decorated with Inca carvings of animals or a human face on a square stone. Each symbol is of a different colour, correlating to the respective payout values. The pale blue stone symbol has the lowest payout. Payouts increase moving from the pink, tan, purple, gold, and to the green stone symbols. The highest paying symbol is the grey-blue stone symbol with the gold trimming. The Free Fall Symbol in the Gonzo’s Quest video slot game is marked by a solid gold stone symbol with a face in the middle. If players manage to land three Free Fall Symbols in a row, this will trigger ten re-spins. During this so-called Free Fall Mode, the multiplier of the game is increased and players can earn up to fifteen free spins while this mode is activated. Bonus coins can also fall from the symbols. When this happens, the Gonzo character will run over to catch the fallen coins with his helmet. The amount of coins that Gonzo manages to catch will be added to the player’s winnings making it one of the the best online pokies in Australia. The wild symbol in NetEnt’s Gonzo’s Quest video slot game is represented by the grey stone, engraved with the gold question mark. The wild symbol can be used to substitute any of the other symbols, and by doing so it can help players complete as yet incomplete pay lines and make up winning combinations.